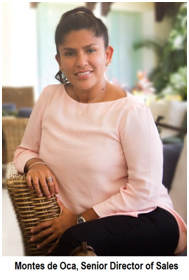 Riviera Maya, Mexico (August 22, 2016) - Eduardo Vela Ruiz, founder and president of Mexico's "Beyond All Inclusive, Beyond All Compare" Velas Resorts, announces Denys Montes de Oca has been promoted to Senior Director of Sales and Gina Jimenez to Director of Sales of the AAA Five Diamond Grand Velas Resorts in Riviera Maya and Riviera Nayarit. In their new positions, Montes de Oca and Jimenez are responsible for the development and implementation of worldwide sales for the luxury "Beyond All Inclusive, Beyond All Compare" resorts, members of Leading Hotels of the World. Together, the two will also develop and execute the sales strategy for Casa Velas, the Mexican hotel group's boutique adults-only hotel and ocean club in Puerto Vallarta. The appointments are effective immediately. 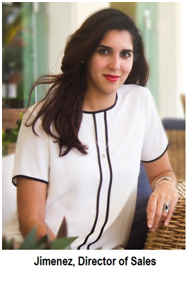 Montes de Oca has held various positions in the sales department at Grand Velas Riviera Nayarit for almost a decade, most recently as Director of Sales & Marketing for Grand Velas Riviera Nayarit and Casa Velas. Most recently, Jimenez was responsible for Corporate Sales for Velas Resorts, which in total operates four luxury all-inclusive resorts in three top beach destinations in Mexico. A fifth property of the family owned and operated company, Grand Velas Los Cabos, is opening late 2016. Montes de Oca and Jimenez can be reached at dmontesdeoca@velasresorts.com and gjimenez@velasresorts.com, respectively.